On a remote Highland mountain, the body of Elaine Buxton is burning. All that will be left to identify the respected lawyer are her teeth and a fragment of clothing. In the concealed back room of a house in Edinburgh, the real Elaine Buxton screams into the darkness. 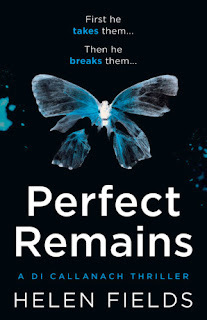 Barrister turned novelist Helen Fields' debut crime thriller show plenty of promise and has got an awful lot of online reader adulation, but I was somewhat left with slightly mixed feelings. There is a lot to like about this first DI Callanach tale, but for me it was a little patchy at times, which denuded some of the excellence it hinted at in other parts. It is a solid, creepy debut that sets things up for a potentially intriguing series though, with a good setting and cast of core characters. It's a stark set-up, with an abducted, terrified woman effectively left for dead, as a badly burned body is made to look like her corpse. Why, to what end? Fields sets the hook pretty well, but grabs readers attention straight out of the gate more with the early events she concocts than her prose style. There's a whiff of clunkiness or even cliche at times, even if the events are fresh in some ways. That dichotomy kept me from feeling fully engaged and 'sucked into' the tale, although the pages still whirred. Some of that is smoothed out as this debut novel unfolds, but still flares now and then. The central figure of what's become an ongoing series is a Franco-Scottish former Interpol agent, DI Luc Callanach. He's joined the Edinburgh police force after being bundled out of his old job amidst troubling circumstances. Fields makes some brave choices with Callanach's resume; a less-than-usual take on the 'detective haunted by his past' trope. Callanach has his demons, just in different shades. Interestingly, although Callanach is the designated central figure, I actually found some of the other core characters more compelling during PERFECT REMAINS. He has varied reactions with his fellow DI Ava Turner and her friend Natasha Forge, which keeps things interesting. Those female characters are more nuanced - but in no way am I saying that Fields is better at portraying female characters than male characters, as some of the other male characters (eg the medical examiner) are scene-stealing, and other female characters (eg a woman from Callanach's past) are much 'thinner'. Fields creates a pretty good sense of the Scottish setting, both the city of Edinburgh and countryside areas outside of it. But her greatest talents the first time out are probably the way she handles plot and the unfolding story. There's a good sense of energy to this book, a forward motion that largely overcomes the mix of good and 'okay' in some other areas. I should note that some of the moments that felt a bit 'off' to me may not bother many other readers. We all have our pet peeves when it comes to dialogue or character, things that slightly pull us out of an otherwise flowing story. All in all a welcome addition to the British crime writing ranks that shows flashes of something special and plenty of promise for the ongoing series.